Sri Lanka celebrated her 71st Independence Day on 4 February 2019. The Mother Sri Lanka movement (MSL) promotes the Independence Day of our Motherland, as the most appropriate day that all Sri Lankans can celebrate the ‘pride of being Sri Lankan’. Hence, they launched an annual event aptly named ‘Love Sri Lanka Festival’ to be held on the eve of the Independence Day with the first festival held on 3 February 2018 in lieu of the 70th Independence Day, in the presence of President Maithripala Sirisena. The event which was a great success, was endorsed by the Ministry of Tourism and this event is now an annual event to be held on the eve of 4 February. The movement’s aim is to unite all Sri Lankans to join and celebrate been a Sri Lankan, or ‘Sri Lankan ness’. It is an opportunity for all of us living in this beautiful country to put aside all differences and appreciate the positive values of the Sri Lankan people. The ‘Love Sri Lanka Festival 2019’ was held over two days this time during the weekend of 2-3 February at the Viharamahadevi grounds. The event is conceptualised for the enjoyment of all Sri Lankans as well as foreigners, showcasing everything Sri Lankan. It was a celebration of Sri Lankan culture, art, craft, street drama, local fashion and accessories, music and entertainment displayed and demonstrated during two full days of festival. This unique event, is by Sri Lankans, for Sri Lankans for the first time in the history, for the true purpose of rekindling the nostalgia and emotions of being a ‘Sri Lankan’. 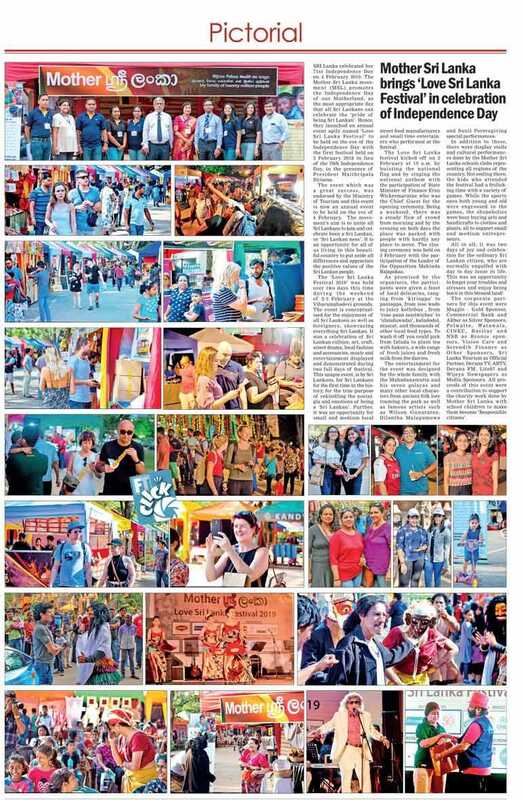 Further, it was an opportunity for small and medium local street food manufacturers and small time entertainers who performed at the festival. The Love Sri Lanka festival kicked off on 2 February at 10 a.m. by hoisting the national flag and by singing the national anthem with the participation of State Minister of Finance Eran Wickremaratne who was the Chief Guest for the opening ceremony. Being a weekend, there was a steady flow of crowd from morning and by the evening on both days the place was packed with people with hardly any place to move. The closing ceremony was held on 3 February with the participation of the Leader of the Opposition Mahinda Rajapaksa. As promised by the organisers, the participants were given a feast of local delicacies, ranging from ‘kiriappa’ to paniappa, from isso wade to juicy koththus , from ‘rose paan sandwiches’ to ‘ulunduwadai’, kaludodol, muscat, and thousands of other local food types. To wash it off you could pick from faluda to plain tea with hakuru, a wide range of fresh juices and fresh milk from the dairies. The entertainment for the event was designed for the whole family, with the Mahadanamutta and his seven golayas and many other local characters from ancient folk lore roaming the park as well as famous artists such as Wilson Gunaratne, Dilantha Malagamuwa and Sunil Pereragiving special performances. In addition to these, there were display stalls and cultural performances done by the Mother Sri Lanka schools clubs representing all regions of the country. Not ending there, the kids who attended the festival had a frolicking time with a variety of games. While the sporty ones both young and old were engrossed in the games, the shopaholics were busy buying arts and handicrafts to clothes and plants, all to support small and medium entrepreneurs. All in all, it was two days of joy and celebration for the ordinary Sri Lankan citizen, who are normally engulfed with day to day issue in life. This was an opportunity to forget your troubles and stresses and enjoy being born in this blessed land! The corporate partners for this event were Maggie – Gold Sponsor, Commercial Bank and Akbar as Silver Sponsors, Pelwatte, Watawala, CINEC, Basilur and NSB as Bronze sponsors, Vision Care and Serendib Finance as Other Sponsors, Sri Lanka Tourism as Official Partner, Derana TV, ARTV, Derana FM, Lite87 and Wijeya Newspapers as Media Sponsors. All proceeds of this event were a contribution to support the charity work done by Mother Sri Lanka with school children to make them become ‘Responsible citizens’.